High-quality ribbon microphones don't come cheap, but the new R101 brings Royer quality within reach of the project-studio recordist. Royer Labs are an American company who were in at the start of what we might call the 'modern rediscovery' of studio ribbon microphones. David Royer brought his first production ribbon mic, the R121, to market in 1998 and followed its success with the SF12 stereo version. As Royer have grown, so too have the variants spawning from those original microphone designs, with active versions in the form of the solid-state R122 and SF24 and valve‑based R122V and SF24V models. There are even — to the surprise of many — ruggedised stage incarnations, in the shape of the R121L and R122L. All of these mics are manufactured, assembled and quality-controlled entirely in the USA. It's worth remembering that ribbon microphones were a mainstay of recording technology and techniques throughout the early decades of electrical sound recording, but they fell almost completely out of favour as the capacitor mic evolved. Delivering a wider bandwidth, requiring less preamp gain and being more rugged and cost‑effective, capacitor mics quickly took over as the default microphone technology. However, the unflattering nature of the digital domain has revealed some of the weaknesses of capacitor mics, encouraging today's generation of recording engineers to rediscover the sonic virtues of the ribbon mic and the way that its sound character neatly complements modern recording technology. The latest product from Royer is an all‑new design, rather than being based directly on the company's original R121 model as all of their other products broadly are, and is intended to provide a lower‑cost route into quality ribbon microphones. Although, like the other models, the R101 is assembled and fully quality‑controlled in the USA, and the diaphragm and other critical internal parts are made in America, the mic case is sourced from China to help keep the price down. I don't think the model name has any relation to the ill‑fated British dirigible that crashed in France in 1930 — although it certainly is a very chunky‑looking microphone! It is noticeably larger and heavier than the R121 and related models, measuring 200mm in length by 36mm in diameter, and weighing 483g. It is finished in matte black paint. The mic is supplied in a nice flight case complete with protective 'mic sock' and a cat's‑cradle style shockmount (plus 3/8‑inch thread adapter), the mic being held captive in the shockmount via a threaded section at the base of the mic around the XLR3 output socket. The Royer logo identifies the front (in phase) side of the mic, which is a side‑address design. The R101 is a conventional passive ribbon with a very tidy figure‑of‑eight polar pattern, and uses Royer's own offset‑ribbon transducer design with a 1.5‑inch, pure‑aluminium diaphragm that is 2.5 microns thick. This offset design places the ribbon slightly closer to the front of the mic than the back, protected behind a new wire-mesh windscreen construction inside the body's sound entry slots. This arrangement apparently also helps to reduce the proximity effect that can make close sources sound bass-heavy. A high‑efficiency neodymium magnet assembly ensures a reasonable output level of about 4mV/Pa — roughly 6dB more than the original R121. Apparently the R101 is designed for both studio and live-sound applications, with a particular tolerance of loud sources like electric guitar and brass instruments. All Royer microphones are supplied with a lifetime warranty to the original owner and, should it become necessary, the first re‑ribbon is free. The published frequency response is remarkably flat: within about ±2dB from about 40Hz all the way up to about 17kHz, with a mild hollowing of the response by about 3dB between roughly 9 and 12kHz. There's no doubt that the R101 sounds different from the R121 — but it's not dramatically different, and the family resemblance remains. If anything, the new model is a little more recessed in the upper mids (as the frequency plots would suggest) and perhaps a touch more airy at the very high end — but these are subtle nuances. The continuance of the 'family sound' isn't that surprising given that the two models employ exactly the same output transformer and ribbon materials, and a very similar overall transducer design too. However, the R101's transducer has an internal shockmount and the new windscreen system, both of which contribute to making this new mic more robust than previous Royers. The build quality is excellent: this is a very neat, solid microphone, and it is clearly well made, albeit a little on the chunky side. It looks and sounds far more expensive than it is — which is always an attractive feature — and it has a wonderfully smooth sound that's free of any resonances, unnatural peaks or low-frequency phasiness. The high end is nicely open‑sounding and airy, but without any edginess or hype, and it works brilliantly with bright sources like brass, close strings, percussion and so on. It certainly can handle high SPLs too, and being a passive mic, there are none of the headroom concerns that afflict some active ribbon designs. The rear of the mic is noticeably brighter than the front side, but that's an intentional result of the offset ribbon transducer design, and can be used to creative artistic effect. For example, I found using the rear of the mic gave better, crisper results on acoustic guitar than did the front, and while it's nothing that you couldn't get with a good EQ, it's always better to generate the right sound at source if you can. So the fact that the R101 has that flexibility built in is useful. 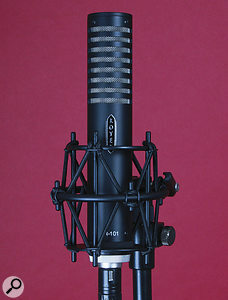 Another handy aspect of the ribbon mic is that you can usually apply heavier equalisation than you can with most capacitor mics without it sounding nasty, and while I don't recommend using fistfuls of EQ to 'create' the required sound, when you need it to, a ribbon mic does accept the challenge better than most other mics. 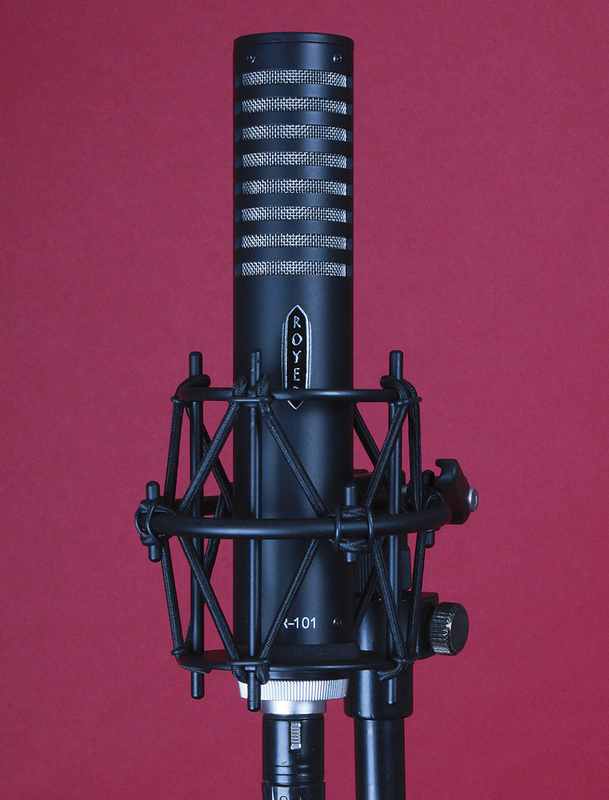 The R101 is also a great mic to use for vocals, and especially female vocals, where its smooth, resonance‑free top end reveals the beauty of the voice without emphasising any sibilance or hardness. I have often used my own AEA R92 ribbons on voices, using the bright or dark tone on the front and back lobe to best suit each voice, and the proximity effect to support the lower octaves. The new Royer R101 works in exactly the same way, and sounds every bit as good. Obviously, plosive blasts must be avoided, and a separate pop screen is probably a must‑have rather than a nice-to-have, although the mic's built‑in wind‑shielding is quite effective and does provide some extra peace of mind. Ribbons always work well on electric guitar amps, again mainly because of the smooth top end, which complements the sound in a very natural and revealing way. You get all the presence and detail without the bright harshness common of capacitor mics, or the dull sluggishness of moving coils. You have to be careful to keep the mic away from the strong magnetic field of the amp's power transformer, of course, but that's not a problem in most cases. It's a brave engineer who places a ribbon mic in front of a kick drum — and I haven't done it since reviewing the remarkable Crowley & Tripp El Diablo ribbon mic (now part of the Shure product line) a couple of years ago. However, the excellent manual that comes with the R101 provides detailed information on how best to use the mic for that slightly frightening application (as well as myriad more conventional uses) and explains in some detail the need to angle the mic across the direction of the main air blast to give it a fighting chance! But with a specification that claims a tolerance in excess of 135dB SPL at 30Hz, the R101 can cope if placed appropriately. In the UK, the Royer R101 retails for approximately 40 percent less than the R121 — and while the flagship model does still have a little more sonic finesse, the R101 is priced very attractively in comparison. Indeed, it retails for less than the Coles 4038 and the AEA R92 too, which places it very firmly in the 'worthy of serious consideration' category! If I didn't already own a pair of R92s I'd certainly be whipping the credit card out without a moment's hesitation! We've reviewed many ribbon mics in these pages over the years, and covered a wide range of them in a ribbon-mic product group test back in November and December 2007. The AEA R92 is an obvious alternative, as is the classic Coles 4038 — both are in a similar price zone and capable of similar levels of resolution and detail. When it comes to more budget ribbon mics, choices abound these days. The ShinyBox 46, for example, is a remarkably cost‑effective ribbon capable of a very decent performance, as are the SE Electronics Voodoo VR1 & VR2 reviewed elsewhere in this issue. Models from Audio-Technica, MXL, Sontronics and Golden Age are also be worth auditioning. Typically warm and smooth sound character of a ribbon mic. Excellent build quality and good supplied accessories. None, assuming it falls within your budget. A Royer for the masses! The company's first mid‑priced ribbon maintains the sonic character and virtues of the flagship models, but in a more affordable package. Pro Audio Europe +44 (0)207 281 4478. Royer Labs +1 818 847 0121.